This one contains script for generating the database. After database is created, the data is stored in MDF and LDF files. This is a primary data file where schema and data of the database is stored. This is a log file where a transaction log information is stored. It keeps track of everything done to the database and can be used to rollback or restore the database. Note: With SQL Server 2005, Northwind database got replaced with AdventureWorks database. If you would like to give AdventureWorks a try, you can download it from GitHub. As already mentioned in previous step, MDF file is where data of the database is located and this file can be used to attach the database to the server, so this is the first thing I tried. This tool is available when you install SQL Server 2012. Using Windows 7 you can easily run it by typing sql management in the Start Menu search field. 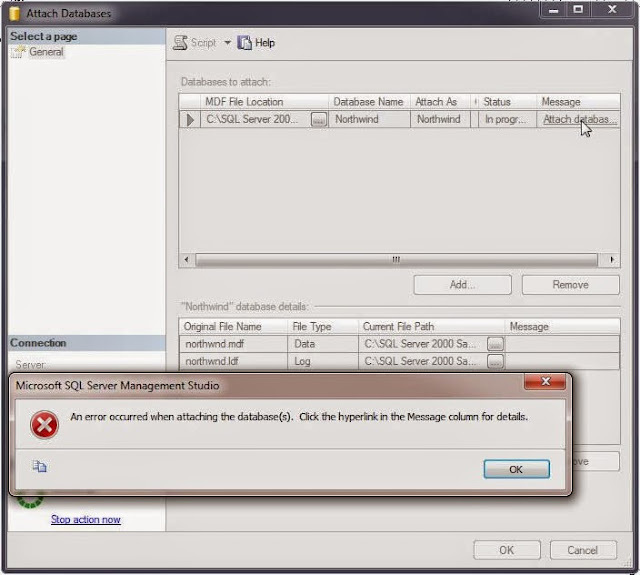 Tip:If you are using SQL Server 2008, you might not have this tool. You can obtain it from Microsoft Download Center. The database file that you are attempting to connect to is not compatible with the current instance of SQL Server. To continue, you must upgrade this database file....Do you want to upgrade the database file now? I clicked Yes hoping the upgrade will work, but I received another error instead described next. Unable to open the physical file C:\SQL Server 2000 Sample Databases\NORTHWND.MDF ... Operating system error 5 (Access is denied), Microsoft SQL Server Error 5120. 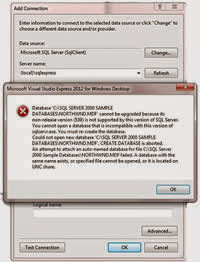 Database C:\SQL Server 2000 Sample Databases\NORTHWND.MDF cannot be upgraded because its non-release version (539) is not supported by this version of SQL server...CREATE DATABASE is aborted. So instead of attaching the database I decided to try to execute instnwnd.sql file. This attempt was successful and is described in the next section. 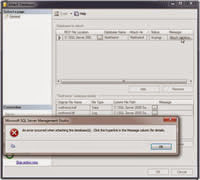 To execute script I used SQL Server Management Studio 2012 (SSMS) tool that got installed with SQL Server Express. Original script also gave me errors but after a little search on the web I found few different suggestions what to modify in the script, one of which worked. When the SSMS is loaded, Connect to Server window will appear. Click on Connect button. If you are unable to connect to the SQL Server, maybe you are not using Windows Authentication. If that's the case, select SQL Server Authentication for Authentication and provide the necessary username and password. After successful connection, your SQL Server instance should be listed in the Object Explorer. Now under File Menu select Open > File. SQL script should open in the main window. All that is left is to execute the script, so click on Execute. After following above steps you should now have Northwind database on your SQL Server. With Northwind database you cannot simply attach it or execute its original .sql script on newer versions of SQL servers like 2012 or even 2008. This article demonstrated how to successfully execute instnwnd.sql file with just a small modification in the script. I hope you have found this post useful. Feel free to drop a comment or share this article on a social networks. Thank you very much, made my night. Great article... thanks for the help. Thanks so much for publishing this. I had run into the same problem. Thanks so much for an excellent article and solution. Thank you sooooo much. It worked perfectly. THANK GOD! I've been screwing around with this all day. Thanks so much! Thanks a lot for help. Am beginning to learn SQL today, wish me all the best. Please let me know if there are any specific tutorials of yours so that I can go through. Very helpful. I found a Northwind database that I did not have to alter which I installed on one computer but had so much difficulty finding the same address from another location that i tried your method. If worked great and no issues at all. Thanks a bunch!!! I faced the problems exactly as you mentioned but was able to resolve it with the steps you gave. Excellent walkthrough. You saved me from lots of frustration. When I ran into the issue and discovered compatibility issues between 2012 and 2000 I realized it was going to be stressful and time consuming. However, when I ran into this post instructions were quite simple so I gave it a try and IT WORKED. what a relief ....thank you!!! Thank you. It works with SQL 2014 too. Perfect, it was working very well, thank you! Thank you, I was trying to do it since morning , your solution worked great. Thank you so much. that REALLY helped me. My teacher and my entire class could not get it working on my computer, but your solution worked perfectly. Simple solution that easily resolves a major predicament; thanks a bunch! Thanks; it worked great! I tried many other methods but it was only this one that worked. hi, it works fine. thanks for sharing. Thank you so much!! Great article helped me with error. Altering the script as you said worked. Thanks. Thank you so much!!! It worked! Thank you soooo much! finally it is work! How to make it work on Macbook with MySQL? That works thank you . tnx a lot. It works perfectly. Works exactly as the author says on SQL Server Management Studio 2012 ! It worked for me. Thank you so much. Thanks! A much better fix than Microsoft suggests! I spent hours trying the Microsoft method, and then found your site. Great work ! Thanks from Belgrade - Serbia. Why it doesn't work for me?? 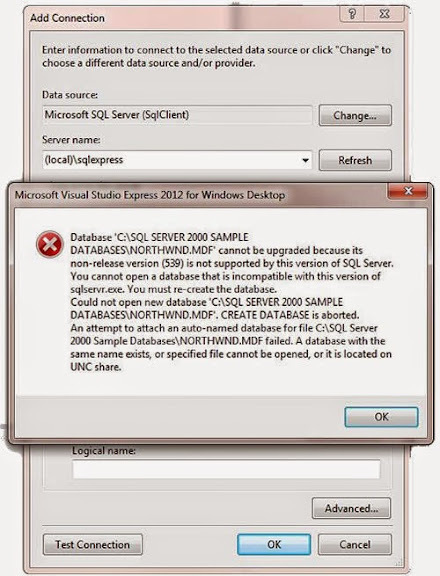 It took me almost 3hrs to figure it out how to attach Northwind database on Sql Server 2014. Brilliant, this worked perfectly with SQL Server Express 2014! Thank you and it made a big help! Clear, concise, *AND* it worked exactly as you noted - thank YOU!!!! Excellent. Worked like a charm!! Thank you for writing this up, saved a lot of time. I deeply appreciate this. Thank you so much! This post helped me a lot...I spent a lot of time trying to attach the databases and also trying to find information on internet but nothing worked, except this post. It was really really helpful! it is helpful to the beginner like me, thanks a lot. Wow i like the way you post the problem and the solution. This help me. Thank you for very useful article. Hi. You need to open instnwnd.sql file and then edit the code as shown in the article. Thanks, made it work for me. It worked fine. I couldnt find the PUBS db after successfully running the script. Re-opening the SSMS, displayed the PUBS DB. Thanks a bunch. Its 2017 and yet this article is helpful. thanks a lot! Super, it really helped me lot. Thanks. Your are SQL God! Wow! It worked for me and its 2017. Thank so much. It really works. It worked . Thank you very much !! This was fantastic !! Worked like a charm. Very good Post. Thank you so much. This helped a lot!!! Thanks!! Thank you so much! I was struggling with this for some time. 9. Close and restart SSMC and northwind will appear! I was wondering why the solution did not work. I did as you suggest and it worked. Nice work, kind Sir!!! DB installed with no problems. I could not have done it without you! Many thanks!!!! WOW!!! I'm so thankful that you uploaded this! A big thank to you. I followed the exact procedure, which worked perfectly as mentioned. This still works! Great article, and perfectly to-the-point without extraneous info.